Defense join the rushes. Middle lane drive. Pass of the pads. Rebound every shot. Players know the drills before practice and go from one to the other. Players and coaches move the pucks together. No one goes to the board as the coach simply calls out the next drill. This is a routine that the players learn. Two teams have the ‘Black Aces’ who won’t play that night do skills and conditioning. 1. Breakout 5-0 at both ends, do a rep from each side and have the goalie handle the puck. 2. Shots from three lanes. 3. Small horseshoe 1-1; do both and then change sides. 4. Dump in and breakout 3-0, regroup and attack 2-1, then repeat at the other end. 5. Individual and partner skills: point shots, face-offs, cut in and score, goalie warm-up, edges, passing, attack 4-0 with options, conditioning skate. Wally reviewed tactical controlled skating and proper posture and minimum cross-overs in backward skating. D jump up and join the rush. First one over the blue line drive the middle lane to the net and the other two save ice forming an attacking V. Pass to either player or the fourth player on the rush or shoot. 1. Start at the 4 blue lines, F one side F and D the other. 2. D1 pass cross ice to F1 at the far blue line. 3. F2 cut to the middle from the opposite blue line. 4. D1 join the 3-0 skating up the wide lane. 5. F2 skate hard to the next through the middle lane. 6. F1 pass across to D1 just inside the top of the circle. 7. D1 shoot and all three crash the net for a rebound. 8. D2-F3-F4 repeat in the other direction. 9. Defense switch sides to so the shots come from the other wing. * To make this a situational drill 1, 2 or 3 attackers could defend the next attack at the same net. Protect the puck by shielding with the body and moving it out of the defenders reach. Defender keep the stick on the ice and blade on blade. 1. Pair up with a partner. 2. Start with a puck along the boards facing each other about 3 m. from the puck. 3. Battle for the puck in a small area on the whistle. 4. Go 10” and the player with no puck do push-ups. 5. Move the puck 3 m. from the boards and start from the boards. 6. Battle again for 10”. 7. No puck do push-ups. *Players can also start about 3m. from the boards (10 feet) with the puck against the boards. * A good progression is to play 2-2 keepaway with 1 point for 7 consecutive passes, then to 4-4 and have rules such as only backhand passes, or one hand only on the stick. This was a off season practice for prospects. They did a lot of work on skills and good habits. Most of the things can be done at any level. Below is a link to the video youtube and in the video section. This is another skill practice for pro prospects. The video on youtube and on this site. 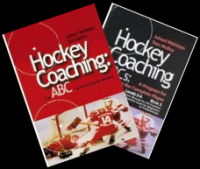 These are the PDF's of hockey practice ideas that I have put together over the last ten years. Ideas from every level; pro men to boy's, pro women to girl's. North America and European teams. They can be sorted multiple ways. Refer to the document that explains the coding system used to organize the material to make it easy to find what you want. These also can be sorted in various ways. These videos also cover every gender and age and hockey level. If you don't like the ideas at least you can see how the rest of the hockey world practices the game. I wish I had video from the over 800 hours I coached Korean school, university and pro teams from 1988-97. In Europe they have used 'Games to Team the Game' for a long time. Soccer is the main sport in most countries and the games model has been part of that sport for a long time. Some countries more than others. The idea is gaining traction in North America with the USA taking the lead and Canada being dragged behind like a screaming unruly child. It is great to use SAG's like cross ice 3-3 but with rule modifications like everyone must get a pass or you must make an escape move when you get the puck you can use them to teach players how to use their skills within game situations. Transition games use only one puck and no whistles. They are a natural progression for game situation drills 1-1 to 3-2. Players flow into the game situation either actively or passively and you can practice every situation for individual and team skill. The first coach I saw using these was Vladimir Jursinov the famous Russian and Soviet multiple Olympic coach. Erkka Westerlund the Finnish Olympic coach produced a booklet and video for Hockey Canada on how to use Transition games. Some NHL coaches like Mike Babcock and Glen Gulutzan use them on a regular basis but not as much as they could. Protect the puck with the legs and body. Make fakes and hard cuts to warm-up. Take long shots if it is the start of practice. Hit the net. 1. Three players skate into the neutral zone with a puck from each end. 2. Handle the puck and try to knock the puck off other players stick. 3. On whistle closest player to each net skate in and take a shot. 4. Coach pass to any player who lost the puck. * This can also be an overspeed drill going as hard as you can. * Add shooter rebound or screen after taking a shot, exchange passes with next shooter. Shoot with your feet moving. Go to the other corner when finished. Players don’t need whistles and can leave when the last play is finished. 1. One player leave with a puck from diagonal corners and skate around the dots at the far blue line. 2. At the same time players leave from the other corners and skate around the dots at the near blue line. 3. Shoot and follow the shot for a rebound. 4. After shooting either screen, circle back to rebound for the next shooter, give and go with the next shooter or defend a 1-1. * Add pivots, Crosby's, any agility skating. * Another option is to add exchange pucks with the player leaving from the diagonal corner. Make as many passes as possible and only one pass in the offensive zone. Use hard wrist passes with no slapping noise. Give a target, face the puck, shoot while skating, follow the shot for a rebound. Add P1-P2 stand on the blue line and exchange passes with next attackers, or defend 2-1 or 2-2. Could start with a cross ice pass P1-P2 then cross. 1. Start 2-0 from opposite corners P1 cross and drop with P2 inside the zone. 2. Pass to any of P3-P4-P5-P6 at the blue lines. 3. P1-P2 skate around the middle circle and cross. 4. P3-P4-P5-P6 make as many passes as possible before P1-P2 go offside. 5. Pass to P1 or P2 before they cross the blue line. 6. P1-P2 attack 2-0 with a max of one pass in the offensive zone. 7. P1-P2 rotate to the near blue lines.P3-P4 move down to the corner. 8. P7-P8 leave from the opposite end and repeat. * Have a contest to see which end can make the most passes. Do the rushes at full speed. Hard flat wrist passes. Fill the three lanes and the player in the middle drive the net hard ready for a pass or rebound. If there is no pass available choose to shoot or pass of the pads. One time the puck on a cross pass. Hit the net. 1. P1 cross and drop to P2. 2. P3 carry the puck and regroup with P3 at the other end. 3. P3 skate to the 'big ice' between the dots and pass to P1 before the blue line. 4. P3 skate hard to the net and stop. 5. P1 pass across to P2 who one times the shot. 6. P4 and P5 repeat from the other end of the ice. * P1 could shoot to score, make a pass off the pads to P2 or pass to P3. * Weak side attacker save ice and be ready to shoot from near the dot. Protect the puck and pull the defender up the boards before passing. Give a target and one touch the shot. Give shot options on both sides of the net. 1. Coach shoot the puck into the corner and pressure the puck. 2. F1 get the puck and skate up the boards. 3. F2 go below the goal line. 4. F3 mirror the puck from the high slot. 5. F1 pass low to F2 and skate into the slot. 6. F3 skate across to the other side of the net. 7. F2 pass to either F1 or F3 who shoot. * Another option is F2 to walk out or wrap around with the puck. Attack with speed and defense join the rush. Defenders play a tight gap and communicate. No whistles are needed. 1. Defense leave from one side and forwards from the other side in the neutral zone. 2. Coaches pass new pucks in when the rush is finished. 3. Start with a 1-1 and F1 attack vs. D1 and F2-D2 follow the rush. 4. Coach pass to F2 and F1-F2-D1 attack 3-1 vs. D2. 5. F3-D3-D4 follow the rush. 6. Coach pass to F3 and F1-F2-F3 attack vs. 4-1 vs. D3-D4. 7. This drill can be done as a one puck transition game with the same flow but D and F's join the next rush. * Transition games are the natural progression for situation drills. Transition games use one puck and the defender must make a breakout pass. The attackers must also battle for loose pucks and finish the attack. * To work on the forecheck and breakout a dump in can be added. * Add intensity by keeping score and reds play vs. the whites. Low forward support from the defensive side. On low 3-3 man to man from the defensive side. First defender tight on attacker. Second defender a stick length away. Third defender halfway. Defenders communicate who they are covering and any switches. Attackers battle to gain net side and create 2-1’s. 1. Coach pass to F1 in corner. 2. D1 and low forward check F1. 3. Defenders regain the puck and pass to the coach. 4. Coach pass to F2 in the other corner. 5. Low forward skate to support D2. 6. Regain the puck and pass to the coach. 7. Coach now pass to F3 who attacks 3-3 with F1-F2. 8. D1-D2-D3 defend the low 3-3. * This drill can be done at one end or both ends. Defender start with a tight gap and communicate with the backckecker who to cover. Either finish the play and start the new attack or go on the whistles. Attack with speed and get a shot on net. 1. Start with F1 attacking 1-1 vs. D1. 2. When play ends F2 attack the other way vs. D2. 3. 3. D1 join the rush with F2 and F1 backcheck making it a 2-2. 4. 4. F3 start a new attack vs. D3 and D2 join the rush while F2 backchecks. 5. 5. Continue this end to end with the D joining the rush and F backchecking. * This sequence can be used 2-1 to 2-2, 2-2 to 4-4, 3-2 to 5-5. * This flow can also be used in a one puck transition game with D joining the rush and F backchecking. Face the puck, communicate, make quick plays, move your feet, rebound, give a target, screen. Each team has extra players as Jokers on one side. 1. Start 2 vs. 2 with Jokers on each side. 2. Players are allowed to pass to the Jokers. 3. Jokers can shoot or pass. 4. On the whistle two Jokers rotate in from their net end. 5. Shifts of 20-30" and pass to new players on the whistle. 7. Coach shoot in a new puck when it is out of play. 8. Play 1-1 to 4-4 or with uneven or random numbers. Forwards leave from the far blue line and defense from the top of the circle Coach spot a puck below the goal line. Attack with speed and defender create a tight gap and deny the most dangerous play. A 2-1 is really a 2-2 so the goalie must communicate with the defender. Don’t allow the puck to cross the mid-line and take the stick of the player at the wide post after a shot. 1. D1 skate up to the blue line then backwards and turn and pick up the puck. 2. F1-F2 skate into the into the zone for a breakout pass. 3. F1 support on the boards and F2 mirror low and slow from the middle lane. 4. D1 pass to either F1-F2 who attack vs. D2. 5. D1 skate across and defend the attack from F3-F4. 6. D2-F3-F4 do the 3-0 breakout at the other end and F3-F4 attack vs. D1. Everyone must cover one player in the defensive zone in man to man zone coverage. Low three, closest on the puck, second closest within a stick length and third half way. F1-F2 sag to cover the point. Weak side F has net coverage on a swarm. 1. Start with a low 3-2, F1-F2-F3 vs. D1-D2. 2. Whistle and F4-F5-F6 attack D4-D5 from the top of the circle. 3. D1 or D2 join the rush as the trailer. 4. F3 back pressure the puck carrier and F1-F2 backtrack into the low slot. 5. F3 pick up the wide attacker on a middle lane drive. 7. Swarm if an attacker is facing the boards. 8. If the defense clears the puck do a second 5-5. Give a target and face the puck. Pass flat firm wrist passes. Defense keep skating with the puck. 1. Forwards start from diagonal blue lines and D are in the middle. 2. F1 pass to D1 and F2 pass to D2 in the neutral zone. 3. F1-F2 skate across to the far lane for a regroup pass. 4. D1-D2 pivot and make the regroup pass. 5. F1 pass to D2 and F2 pass to D1. 6. F1-F2 pivot for a regroup pass the other direction. 7. D1 pass to F2 and D2 pass to F1. 8. Coaches pressure F1-F2 at each end as they cross the blue line. 9. F1-F2 shoot, follow the shot, then rebound for F3-F4. 10. Switch to a 2-0 double regroup with F1-F3 regroup with D1 then D2 and attack 2-0. Defend from the net side. Stick on the puck and body on body. Offense screen, pick and create 2-1's. Defense communicate and switch if needed. 1. Players start from the top of the circle and coach shoot in puck, R1 attack vs. B1. 2. After about 5" R2 make it a 2-1. 3. Play about 5" and B2 join making it a low 2-2. 4. Next rep the Blue attack and the Red, 1-1, 2-1, 2-2. Finland National Team Coach Jukka Jalonen explains his philosophy on how to practice at a seminar in Latvia then does an on-ice demo. List of drills can be found at the link below. The list of the 2-1 practice ideas can be found at the link below. The list of 2-2 practice ideas can be found at the link below. Links to 3-2 practice ideas is below. List of of links to 3-3 practice ideas below. Develop a power play that fits the skill of each five player unit. Practice the Diamond 1-3-1 both from the blue line and below the goal line. Defend from the net out, stop and start, stick on puck and in the passing lanes. Swarm when the offense doesn’t have control along the boards. Weak side forward fall under and cover the middle attacker. Power play create shooting lanes, screen, crash for rebounds. 1. Start with an offensive zone face-off and run one option 5-0. 2. Breakout from the far end vs. penalty killers 5-4. 3. Use controlled breakouts for each group. 4. Penalty killers come off the bench to defend against the breakout. 5. Power play versus penalty kill. * Breakout with a double swing and five attack. * Breakout in the three lanes and two forwards swing behind for a trailer pass and attack late, these players attack the static defense and carry in, pass to each other or the wide players at the blue line. * Aggressive penalty kill when the puck is loose or the attackers back is turned. * Option one is to have the wide players on their forehand side for one timers. * Option two is to have a passing PP with right and left handed shots on the right and left sides. * Rotate positions and keep moving. * Defender stay with the puck carrier but do not chase passes. * Play a 4-4 on the strong side and deny the cross ice pass with sticks in the lane. * Many teams give the goalie the walk out player jam and cover the other four. * Power play create confusion with quick puck movement, switches and back door options, outnumber the defenders on rebounds. * A coach can use this sequence to practice from 3-3 to 5-5. This is an effective way to do walk through’s of both offensive and defensive team play. You could do situations 3-3 to 5-5. An option is to have one forward low and defend 3-3 and make a breakout pass to the two other forwards, this would get either that F or the D as the third man on the rush. Attack with a middle lane drive and the fourth attacker as the trailer in a diamond. Start at one end with the resting players waiting along the boards and the active players in position. 1. Start with a low 3-2 while the defending team forwards wait to attack 3-2 the other way. 2. Start the new 3-2 on the whistle. 3. One D join the rush as the trailer. 4. Defending forwards backtrack and F1 play the low 3-3, F2 back to the mid-slot, F3 cover the strong side point. 5. Play 5-5 until the attack is finished. 6. Coach spot a new puck and play a second 5-5. *Coach instruct on either the offensive or team play. Link to handreds of passing drills is below.